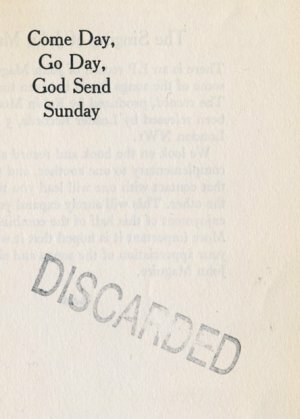 In the beginning was the word and the word was change. Then there was the time I was working in the RTÉ CEL studios recording those things you hear on the radio between those other things you hear on the radio. I can’t say it wasn’t a comfortable and pleasant enough job. Most of the people you’d meet of a day were happy enough to be getting on with it and we’d have a laugh. Some days there was nothing to do at all except sit around watching the hours clock up, just in case somebody had an emergency need to say something on the radio. Or, you could go up to the canteen and get some bad coffee and then go and raid the 2FM library of a few obscure CDs. Terrible altogether, so it was. Me being young and.. well young, I wasn’t always too happy about hearing my work on the radio. It was just that I felt it wasn’t really making a huge contribution to the evolution of human consciousness and the elimination of suffering of all sentient beings. Of course, I had no idea what I thought, I was probably more worried about the positioning of the rips on my jeans. I told myself if I didn’t come in and get handsomely paid for pressing the red button then somebody else would. I invited Tony for the evening and put him and his guitar in the dead sound booth behind the glass. Like a kind of observation room. Sonic observation. So, i went for a last pint with Paddy up in Kiely’s, shook Tom’s pipe smoking and generous hand and said a mental goodbye to the DJs that had spotted and tried to help me resolve my childish unease with establishment. Then I got on me bike and drove out onto the Stillorgan Road and into the future. There’s just no accounting for it. It’s a bit like looking back over an old diary, full of scribblings from midnight bumpy bus rides, some dodgy concept that seemed worth the effort of holding the pen straight at the time. A record I suppose, at least. No relation to this song. I don’t think I have been home in ages. Yes, Swinging Swine Jam, Live in Studio, this has to be from around 1990. Not a lot else to say today. Here’s the first off the CDs I got from Eamonn.Lot’s of nostalgia value here for me. That’s Larry O’Toole there on the talkback at the end of the track. 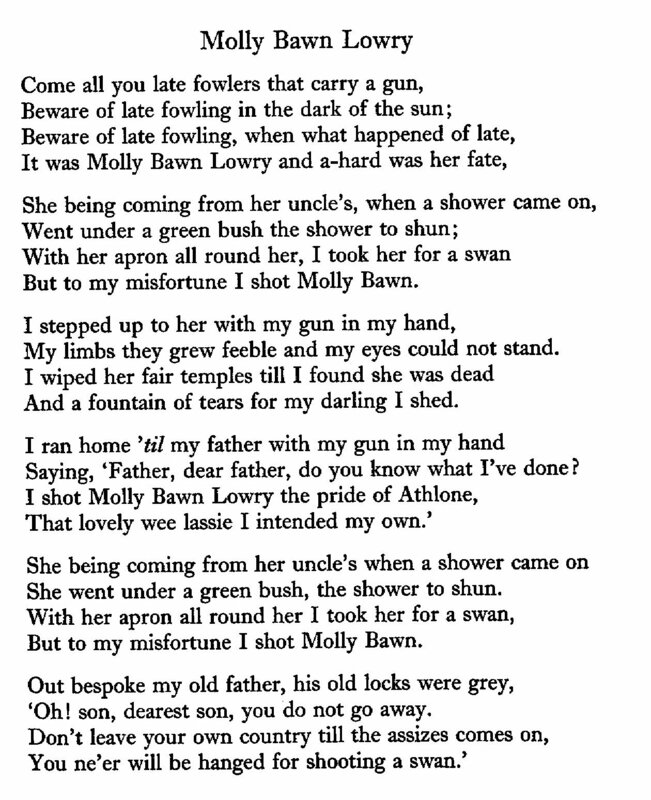 One of the tracks on the Swinging Swine recordings that Padraig posted is a version of a traditional song called Molly Bawn Lowry. This stood out right away for my ears as one of the most interesting tracks on the tape. Maybe because I hadn’t heard it before, or maybe because the combination of Joanne’s vocal style and these words is so attractive.I always did find her accent a little strange, and I still don’t know the words of some of the swine songs. There was one phrase that really got my attention in the song though, – what sounded like the use of the word sizes. – “Don’t leave your country till assizes come on”. 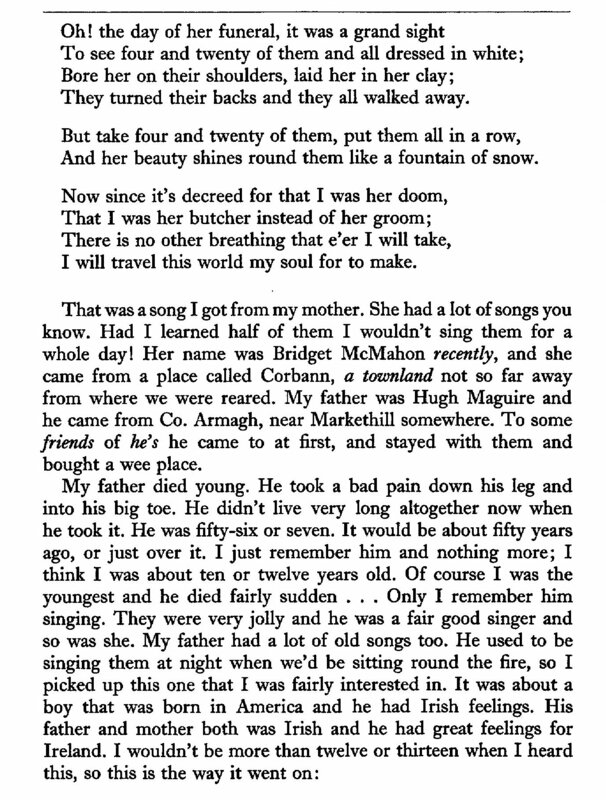 There are of course, plenty of versions of auld songs out there, and searching around for the lyrics, you will find Molly Bawn, Molly Bán and Molly Bawn Lowry and the like. And that’s just the title. (Of all that I’ve read since this is the only version that maintains use of the word assizes, and it’s certainly my favourite). Now. I suppose I could have gone a shorter route from the beginning to find out about this song, and I did eventually put the auld social networks to use and get in touch with Eamonn. This is what he had to say:Molly Bawn….I recall Doug unearthed that. Paul Thomas was involved. I think he had sourced an old ballad book and thats where the lyrics came from. I cant remember if we had heard somebody sing it, but doug put the chords/melody together and Hugh fiddler came up with some parts as well. A great song I think. Indeed, a great song – and there’s plenty of other great songs and crazy stories in the book. It’s full of insight into life in rural Fermanagh just a few years ago. I’m glad I found it in this roundabout way. It’s a lesson about “auld” and about “discarded”.I’m glad Doug found it too, and that John Maguire learned the song from his mother, sang it all his life, remembered it along with about 10,000 other songs, and that eventually Robin Morton took the time to go and talk to John and write it all down so that later on it could be fed to a bunch of scruffy pigs who would make it beautiful. I hope you will be happy about all that too, while listening. 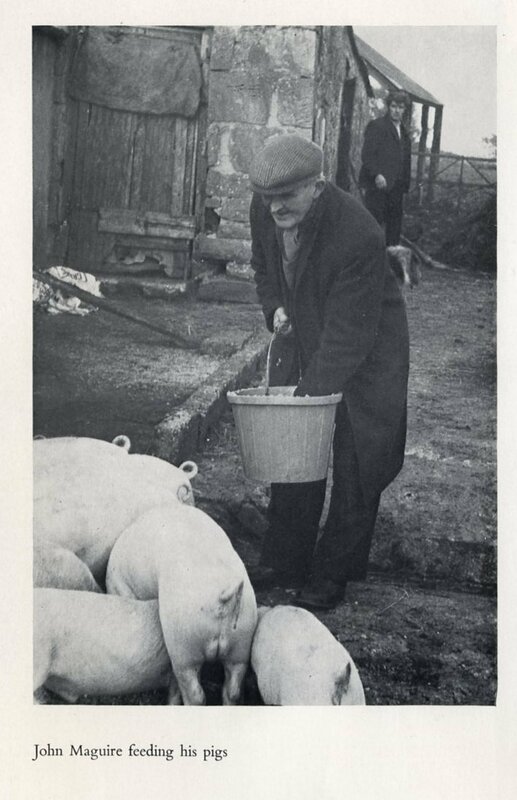 I’ll leave you with the song, and the inside front cover plate from the book, – up to you to figure out which pig is which. Just as lost for words as I was 20 minutes ago on the last post, but this has to get up here before the JCR party that people are putting together this weekend in Dublin.Nothing more to say, this post is dedicated to friends from those times, to blaggin’ in to the Ball, and to Tension of course. It has been a while yet here is another auld tape that was promised before the year was out. But it’s just gone election time, just gone promises time, it is time now for the unfulfiling to begin, – time for auldtapes to be contrary of course. but it’s gettin’ hard to read between the lines.